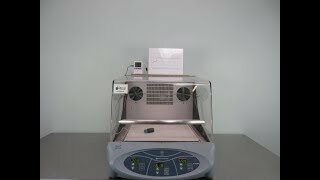 The Thermo Barnstead MaxQ 4000 is a reliable Benchtop Incubator Orbital Shaker used for cell culture, protein expression, extraction process and much more. The inner chamber of this incubator shaker was designed with space in mind as it can handle six 2 liter flasks at the same time, while being small enough to fit on a standard lab bench. The Thermo Barnstead MaxQ 4000 Incubator Shaker has a maximum capacity load of 50lbs and moves at speeds up to 4000 RPM. This easy to use shaking incubator has a temperature range of 10°C above ambient to 60°C. System comes with PID micro processing controls situated on the front of the instrument for easy access. The Thermo Barnstead MaxQ 4000 thoroughly tested and calibrated. All of our lab equipment comes backed with our standard warranty. Should you have any questions, please don't hesitate to contact us.